Donald Trump has had trouble understanding the nuclear triad. He may now want to get a little more familiar with the triad that can bring down a president, because as of yesterday, we now have two of the three legs in place. To put this in perspective, let’s look at the dynamics of what forced President Richard Nixon to resign in 1974. There were three separate but cooperative entities that were “out to get him,” a phrase that Nixon might have used. First, there was the ever-vigilant press. The morning of the Watergate break-in, Bob Woodward of the Washington Post was in court as the five alleged burglars were arraigned. Along with Carl Bernstein, Woodward knew that there was something fishy from the get-go because one of the suspected burglars had the name and phone number of a White House staffer in his possession. Woodward and Bernstein, with tremendous support of Executive Editor Ben Bradlee, followed lead after lead as the loose ends came together to point directly to President Nixon. We should not forget that there was also outstanding reporting from CBS News including Dan Rather, Lesley Stahl and Daniel Schorr. But the media could not have done it alone. Much of the leads that they received came from direct information and leaks from the office of the special prosecutor, Archibald Cox, and later Leon Jaworski. Additionally, leaked testimony from grand jury investigating all matters related to Watergate was essential. The office of the special prosecutor had the power to subpoena witnesses, to file charges and to plea-bargain. All of that was essential to getting to the truth. 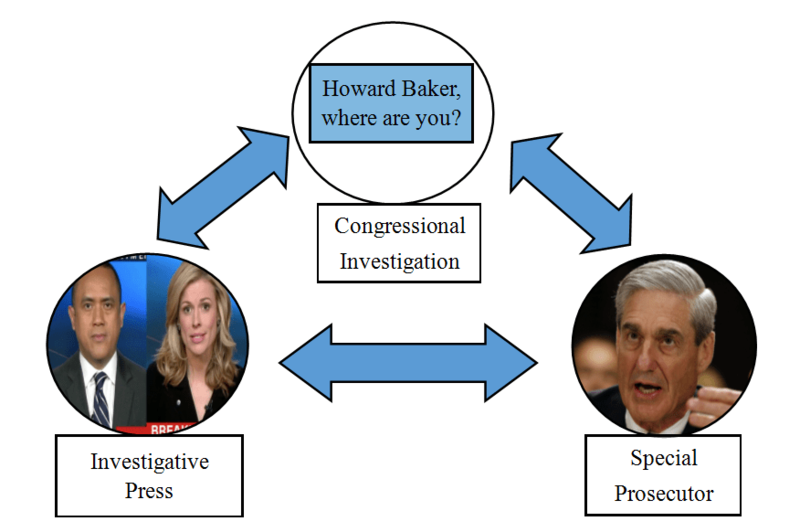 The media, the office of the special prosecutor and the Select Committee each used its own sources and resources and when legal, they shared information with one another. Nixon was caught in the middle of a pincer movement coming at him from three sides. When the combined efforts lead to the release of White House tapes, most particularly the cover-up conversation on June 23, 1972, six days after the break-in, Nixon’s fate was doomed. The House of Representatives was moving ahead with impeachment proceedings, Nixon was the focus of grand jury proceedings, and the media was publishing the indisputable evidence. Nixon wisely chose to resign before being impeached and convicted. With assistant Attorney-General Rod Rosenstein appointing independent counsel Robert Mueller to investigate any connection between the Trump presidential campaign / White House and Russia, we now have two legs of the triad filled. The media has done a remarkable job with special kudos to the Washington Post, New York Times and CNN. What is missing is a select investigative committee of one or both houses of Congress. Republicans control both chambers and they are reluctant to launch a full-scale investigation of their Republican president. In the Watergate era, both houses of Congress were controlled by Democrats, so it was easier. The Democrats already have a “star” in Rep. Adam Schiff, ranking minority member of the House Intelligence Committee. But so far, no Howard Baker has arisen among the Republicans. With the weak-kneed and highly partisan leadership of Mitch McConnell and Paul Ryan, it will be difficult to get a powerful committee together to emulate the Senate Watergate Committee of forty-four years ago. However, there are standing committees in both houses that are already investigating much of what has happened and continues to occur. There is an opportunity for a Republican to become a “star” like Howard Baker, but so far, none seem willing to step forward. But, from the perspective of Donald Trump, he is being “persecuted” from all sides. It’s time for Trump to not only learn about the nuclear triad, but also about the triad that may remove him from the presidency. 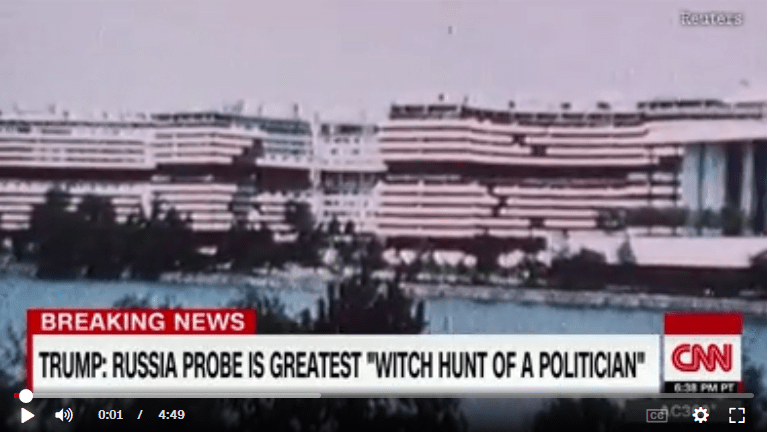 See special five-minute report on CNN about comparisons between Watergate and current situation.